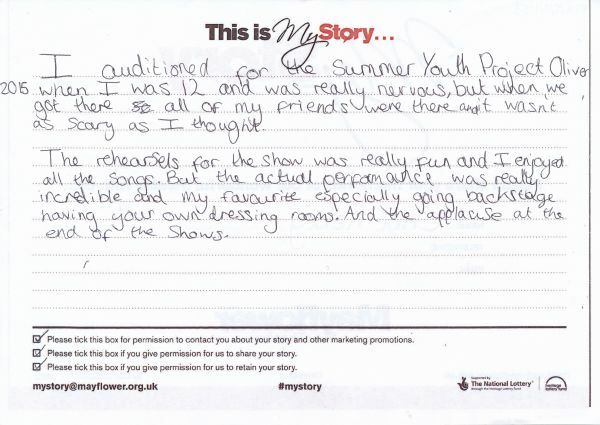 My Story card: Chloe Kelsey remembers her first performance with SYP. I auditioned for the Summer Youth Project Oliver 2015 when I was 12 and was really nervous, but when we got there all of my friends were there and it wasn't as scary as I thought. The rehearsals for the show [were] really fun and I enjoyed all the songs. But the actual performance was really incredible and my favourite especially going backstage having your own dressing rooms. And the applause at the end of the shows.